Our organist and choir director is Chris Dyter. Chris joined Broughton St Mary’s in early 2015 and it has been a joy and a privilege to have him accompany worship on the Lewis organ and piano each week. Chris is a graduate of the Royal Northern College of Music in Manchester, where he studied organ with Jeffrey Makinson and Darius Battiwalla. In addition to his work at Broughton St Mary’s, Chris also does freelance work as an organist and teaches piano, organ, keyboard and music theory. He has previously given organ recitals at Edinburgh’s McEwan and Usher Halls, Bromley Parish Church, Manchester and Chester Cathedrals, and York Minster. Broughton St Mary’s Choir is a friendly and welcoming group of people of all ages and abilities, and new members are always welcome. We practise every Thursday from 6.45 to 9pm downstairs in the Bellevue Room. We start with ‘warm-ups’, and stop around 8pm for an all-important tea-break (with biscuits of course). The choir sing from a diverse range of anthem books and have an ever growing repertoire drawn from across four centuries of church music. We are a small but committed group and do our best to enhance the Worship each Sunday, and to help the congregation in their singing. Our style of worship is broadly traditional with a mix of more contemporary songs, the dignified and uplifting style of worship reflecting the strengths of a richly diverse and ecumenical range of hymns, and making the most of having both a grand piano and a very fine organ. The church has a beautifully blending and clear acoustic which makes music-making a real pleasure. To find out more about the choir please email Chris at choir@bstmchurch.org.uk. 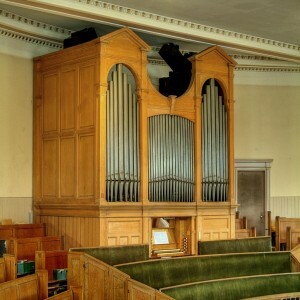 The organ in Broughton St Mary’s Parish Church has been awarded a certificate Grade 1 in recognition of it being an outstanding instrument by Thomas C. Lewis 1882, in original condition. It is listed in the British Institute of Organ Studies Register of Historic Pipe Organs as being an instrument of importance to the national heritage and one deserving careful preservation for the benefit of future generations. The organ underwent major restoration work in 2002 with the generous assistance of a £30,000 grant from the Heritage Lottery Fund. This work was carried out by Rushworth and Dreaper of Edinburgh, who have maintained the organ over a long period.